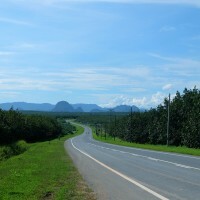 Riding to Natai Beach was something I looked forward to, following our three days of rest in Phang Nga. It was time to get ourselves moving again. 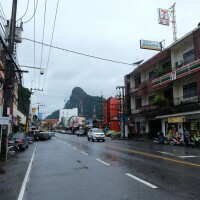 Phang Nga had been pouring with rain since we arrived here two days ago. Clouds had been covering the dull sky for much of our stay. Thankfully, today’s rain was not as bad as yesterday’s. 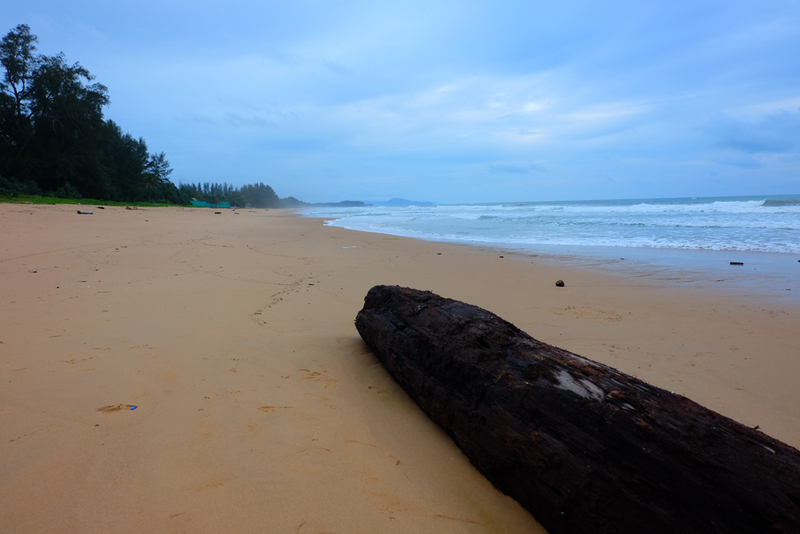 The weather forecast for Natai Beach was quite promising, with rain expected to stop by 3 pm. 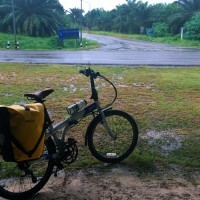 I hoped that, by the time we reached Natai, we could see a beautiful beach and a blazing sun that we had not seen since we started cycling. In the beginning, the journey to Natai Beach was quite easy as we took the famous road #4. We then took a right turn into an unnamed road after pedalling for approximately 15km. The road led us to an even smaller road with a surprisingly excellent condition. The scenery was quite varied too. We passed by a picturesque village with a mountain backdrop, banana and rubber plantations. It was the most beautiful road we had passed throughout our 3 days of cycling. Unfortunately, I did not take any pictures as it was still raining (I could have taken a picture with GoPro! Why didn’t I think about that?!). The road started to get hilly and my nightmare turned into reality when we had to push our bike to go through one very steep hill with a gradient of around 20% (or more). 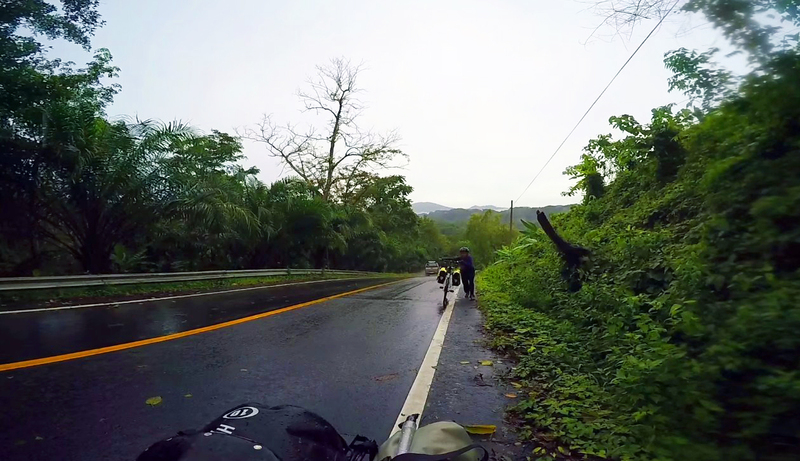 With the amount of load that we carried (maybe around 9 kg of pannier bags), it was impossible to pedal through that steep road. Thankfully, the steep section was quite short and we reached the top in a matter of minutes. If it had not rain, the view would have been so amazing, as I could see mountains and some plantations in a distance. The road after that was super easy – we just had to follow the road signs to Thai Mueang and it was downhill all the way back to the main road #4. We found Natai House, a very cosy room, located a kilometre away from the Natai Pier. The sign was quite visible from the main road. For 500 Thai Baht, it was a steal!!! It was the nicest room I had ever stayed in Thailand so far. Lesson learned: don’t book online during an off-season. The chance is, you will get a cheaper price even without bargaining! 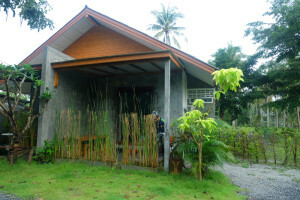 At Booking.com, the same room would cost 700 Baht, which is way more expensive than the walk-in price. I saved 200 Baht for that, which I could use to buy lunch and dinner for 2 persons. Anyway, the owner of the house lived next to it and he had a mini market by the side of the road. We asked him where to get halal foods nearby here, and he said we could cycle about 1 kilometre north as there was one halal stall on the right side of the road. So, off we went to have lunch. We kept on pedalling towards the pier but found no signs of halal stalls. A very nice local Muslim woman – who could speak English – directed us to Khao Pi Lai, a small Muslim village located about 4 kilometres south of the pier. 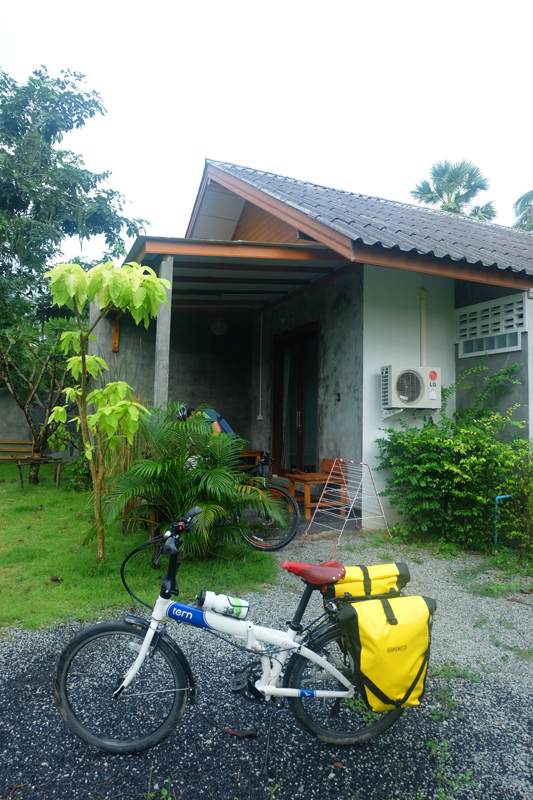 As we cycled towards the village, we passed by a number of super luxurious and expensive private villas, resorts, and hotels that could cost thousands of dollars a night. Natai Beach is one of the last untouched beaches in the mainland of Thailand. 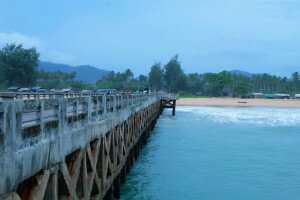 With its close proximity to Phuket and Khao Lak, it is not surprising that this long stretch of beach will get more attention in the near future. Even now, I could see more and more villas and resorts facing the beach being built. It is a sad reality how commercialisation and mass tourism start to creep into peaceful villages of Thailand and consequently, change the way these villagers live their lives. Just before we reached the village of Khao Pi Lai, we found a roadside stall located directly opposite the luxurious Sava Villas. There were two locals eating there. Since we were too hungry to cycle even further, we decided to give it a try. A Muslim Thai woman prepared a grilled chicken with glutinous rice and som tam (green papaya salad). They were so delicious! The som tam was freshly made and surprisingly crunchy! I love it!! The stall unfortunately closed by 1 or 2 pm, so we decided to order more for dinner. After having the most satisfying lunch, we cycled to Khao Pi Lai, passing by a medium size masjid/mosque. A few meters from the masjid was another stall ran by a Muslim family. We stopped by and had a look at the foods that were pre-packaged. We decided to buy the curry and some other snacks. One of the women asked where we were from. Upon knowing that I was an Indonesian, the lady called one of her relatives who could speak a bit of Indonesian. Well, that was indeed a surprise! She told me that many exchange students from Indonesia visited her school and that’s where she learnt the language. I was quite impressed that she could converse with me in Bahasa Indonesia! I just loved talking to locals. I told her that we would come back here tomorrow for breakfast. We came back to our accommodation, showered, and unpacked our stuff. After my online meeting with fellow teammates (yes, I had to bring my work here! ), we went out at around 5 pm to check out the beach, which was located a few meters away from the place we stayed. The rain had stopped a few hours ago but the wind blew strongly and the waves crashed into the shore violently. The golden sand along the seashore was soft and gentle. We were the only tourists around here. It felt so great. 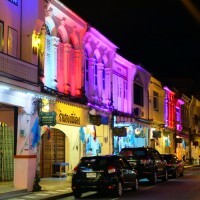 I could imagine how beautiful this beach would be during high season — neon-blue sky and jewel-blue sea. Such a gorgeous place to find tranquillity and contentment. Unfortunately, during monsoon season, nothing much we could do around here, as it was impossible to swim. 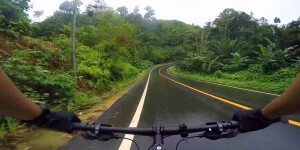 Avoid western part of South Thailand as much as you can during monsoon season! Be notified when there are new updates! A traveler by birth. Third-culture kid. Citizen of the world. Global nomad. Avid hiker. Cycling enthusiast. Occasional diver. You name it!